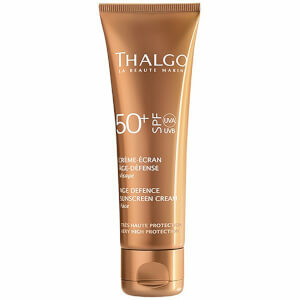 Safeguard your skin with Thalgo Age Defence Sunscreen Cream SPF 50+, a very high protection sun lotion for the face and décolleté. 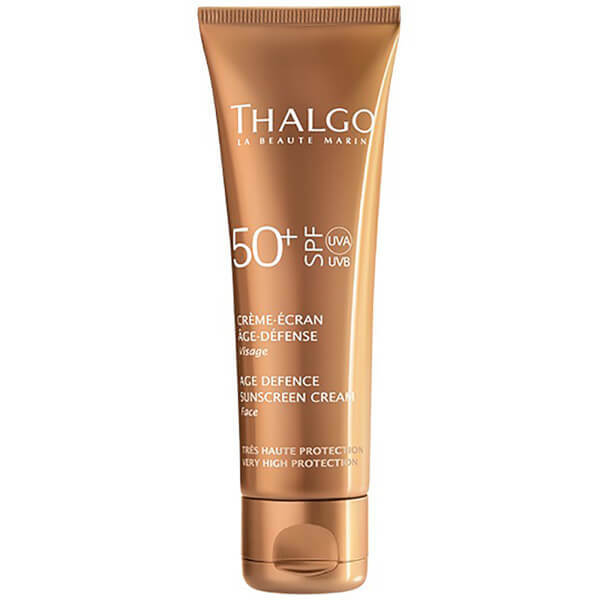 The high tolerance, non-whitening formula delivers an invisible shield of protection on skin that never feels greasy or sticky, and expertly protects against UVA/UVB rays and premature ageing. Suitable for fair and sensitive skins, it feels comfortable on application and encourages the development of a gradual tan while preserving skin's youthful appearance. Aqua (Water), Ethylhexyl Methoxycinnamate, Coco-Caprylate/Caprate, Cetearyl Alcohol, Butyl Methoxydibenzoylmethane, Diethylamino Hydroxybenzoyl Hexyl Benzoate, Octocrylene, Cyclopentasiloxane, Bis-Ethylhexyloxyphenol Methoxyphenyl Triazine, Capryloyl Glycine, Cetearyl Glucoside, Ammonium Acryloyldimethyltaurate/VP Copolymer, Parfum (Fragrance), Helianthus Annuus (Sunflower) Seed Oil, Dimethicone Crosspolymer, Potassium Sorbate, Citric Acid, Sodium Hydroxide, Polysiphonia Lanosa Extract, Sodium Benzoate, BHT, Haematococcus Pluvialis Extract, Phenoxyethanol.